Asian Carp is a catch-all name we use in North America to describe four different species. 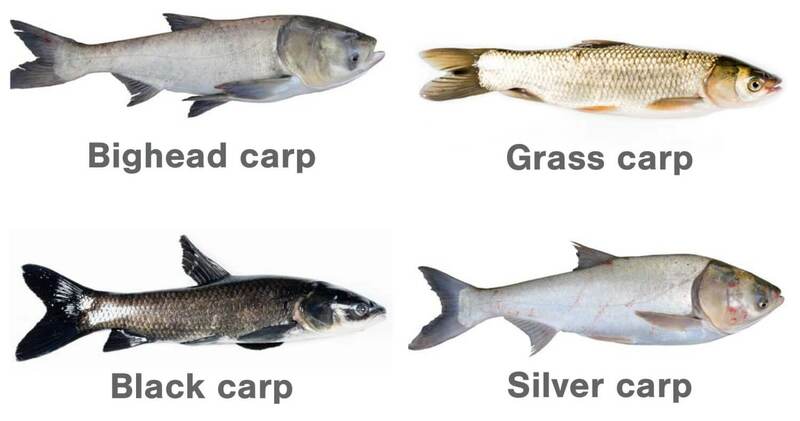 These are Grass Carp, Black Carp, Silver Carp, and Bighead Carp. They are regarded as invasive species, causing damage to the ecosystems they now inhabit. The destructive threat they pose has caused North American governments to act to reduce their numbers. As the price paid for Asian Carp continues to rise, Asian Carp are becoming more valuable to commercial fishermen. Several state governments are offering a bounty that increases the amount paid per pound of Asian Carp. There are initiatives underway to increase their use in restaurants and to create an export trade to China, where they are highly prized. 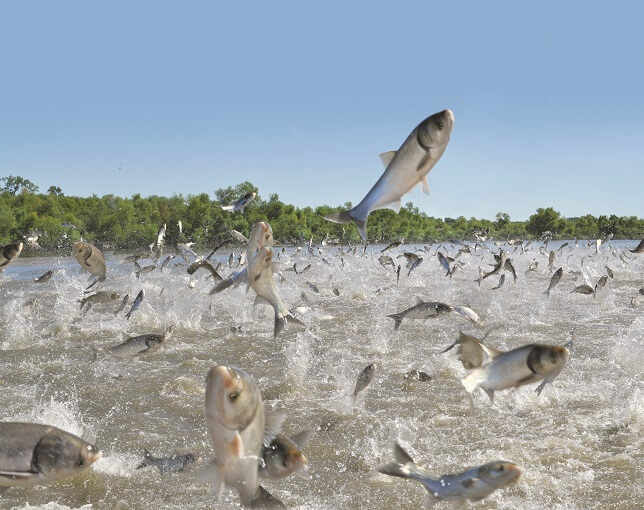 The enduring image we have of this invasive species are Asian Carp jumping. In particular, Silver Carp will leap out of the water when spooked. The largest Silver Carp can reach 100 pounds or more. This can make operating watercraft very dangerous in areas with Asian Carp populations. Reports of injuries and damage to watercraft are common. Aside from the typical bumps and bruises, an Arkansas resident had his jaw broken by a silver carp while tubing. In some areas, boats now have netting around the boat to protect the passengers. For over 1,000 years, Asian Carp have been cultivated in Chinese Aquaculture. 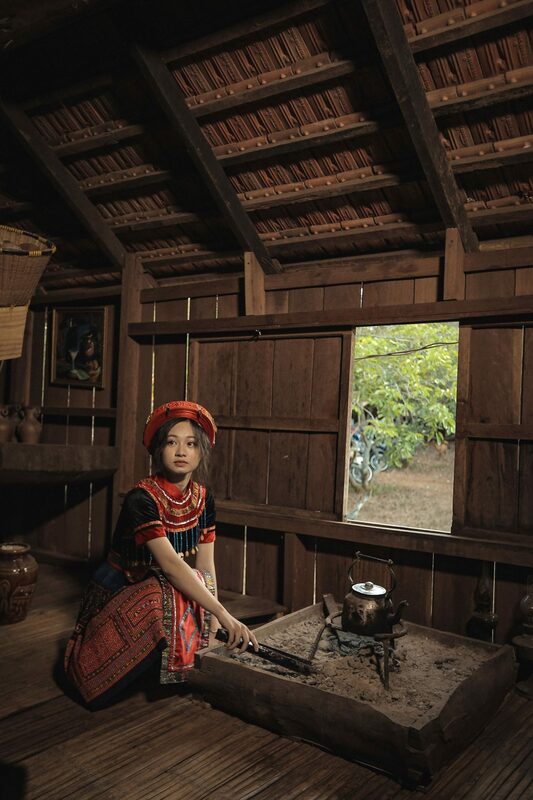 To this day in Asia, they are a prized food source, a symbol of hard work, and perseverance, a tourist attraction, and a partner in rice production. They are also regarded as a “threatened species” and are trending towards endangered status in Asia. In great contrast, Asian Carp in North America are considered invasive and a threat to ecology of the waterways and lakes where they gather. First imported to the US over 30 years ago, Asian Carp were meant to clean commercial catfish ponds. Unfortunately, over the years the Mississippi River would flood these aquaculture ponds which allowed the Asian Carp to have access to the Mississippi River. As it turns out, the Mississippi river is an ideal environment for these fish to thrive. Today, Asian Carp have spread throughout the Mississippi River watershed. Even though the carp were supposed to be sterile, they have found a way to reproduce in significant numbers. This has changed the natural balance of the ecosystem and could lead to the extinction of some native species. The U.S. Fish and Wildlife Service, the U.S. Environmental Protection Agency, the U.S. Army Corps of Engineers, and the Canadian Department of Fisheries and Oceans have introduced plans to deal with the problem of Invasive Asian Carp. Recently, U.S. state governments have also gotten more involved, usually offering bounties to increase the price paid for Asian Carp to entice more commercial fishermen to target them. 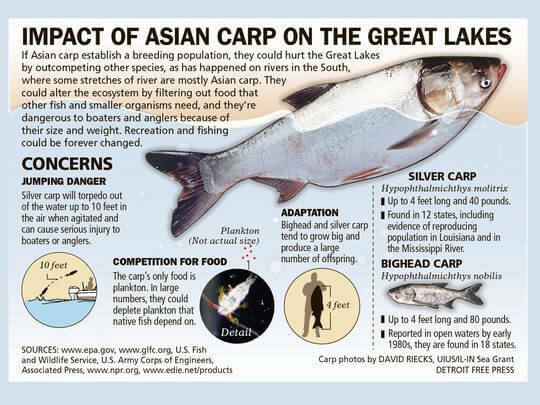 The flashpoint issue is the threat of Asian Carp entering the Great Lakes and establishing a population within. Problems cited are harm done to native fisheries and injured boaters, as well as predicted harm to the many businesses dependent on the Great Lakes and the attendant $7 billion-a-year sport fishery industry. One particular waterway, the Brandon Road Lock and Dam near Joliet, Illinois, has become the frontline in this battle. It is an important canal connection between the Mississippi River and the Great Lakes, and possibly the last chance to stop Asian Carp on their way North. It is currently protected with an electronic barrier to scare away Asian Carp. Transportation lobbies claim this is enough protection, while opponents support the new plan from the U.S. Army Corps of Engineers for upgrading the area with a new engineered channel that greatly increases the capability of deterring and removing Asian Carp. The trouble is that this plan has a price tag of $778 million and requires lengthy interruption of naval shipping through the area. This debate looks to continue, while the threat of Asian Carp in the Great Lakes increases. Asian Carp are filter feeders which means a traditional rod-and-reel approach simply will not work. Instead, they are largely caught with nets. On a smaller scale, Asian Carp can also be targeted with bow fishing and snagging. Snagging, or snag fishing, is illegal in most places for most fish, but usually is allowed for Asian Carp. Check your local rules and regulations before heading out. The large population numbers and body size of Asian Carp means net fishing is the best option. Silver Carp are often herded with noise into a net during removal efforts and commercial fishing expeditions. 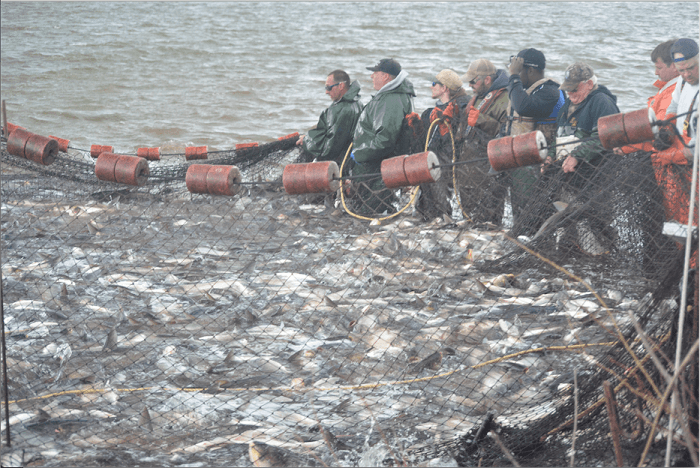 Other varieties of Asian Carp require traditional tactics for Gill Nets to be successful. The abundance of this invasive species has led to some individuals focusing on methods of Asian Carp cooking. Restaurants in areas that have been overrun are finding new Asian Carp recipes and methods of cooking to make the fish attractive to their customers. Long disregarded as a food source in the U.S. because of a bottom-feeder reputation based on sharing a name with the Common Carp, the actual meat of Asian Carp is clean, not fishy, and has a taste often compared to cod or tilapia. It has long been a popular food source in Asia and even a delicacy depending on the exact species and preparation method. Beyond the name, the other problem with Asian Carp is their bone structure. It is very difficult and inefficient to fillet a carp. Many chefs are trying to determine a method of cooking or cleaning the carp to neutralize or remove the bones. So far, they have met with limited success. Setting the problems aside, the abundance of Asian Carp makes it an extremely plentiful food source that is cheaper than hamburger to buy. Even if it remains a niche food source in the U.S., there remains the possibility of exporting Asian Carp back to Asia. In China and elsewhere, it is already a popular food fish. It is popular enough that Asian Carp populations in China are classified as threatened and the Chinese government has instituted occasional bans on fishing them. Several Chinese companies have already come to the U.S. to start their own Asian Carp export businesses back to China and many U.S. fish houses and processors are securing contracts to supply shipping containers full of Asian Carp for export. However, the export process isn’t always the best option. Some entrepreneurs are creating large-scale fertilizer processing plants to turn the Asian Carp into very popular organic fertilizer. At least one company is taking a similar route but producing organic pet food with Asian Carp instead. These solutions, and more, are making the profit potential of commercial Asian Carp fishing grow as time goes by.